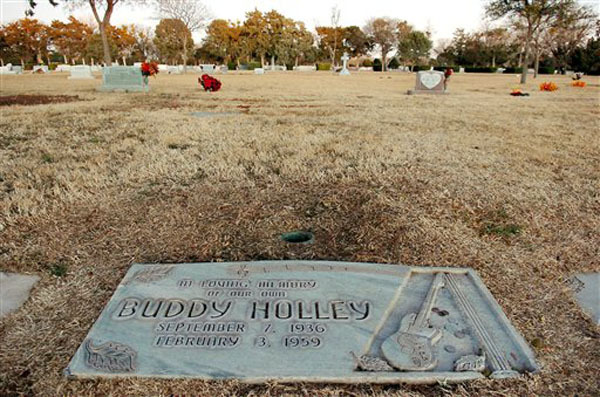 of Charles Hardin Holley, Richard Steven Valenzuela and Jiles Perry Richardson, Jr.
You may know them better as Buddy Holly, Ritchie Valens and The Big Bopper, and the crash of their small plane in Albert Juhl’s cornfield shortly after takeoff from Clear Lake, Iowa, is known as The Day the Music Died. Although just 22 and in show business only for a year and a half, Holly’s signature sound and pioneering style influenced innumerable rock ‘n rollers in his wake: The Beatles are said to have taken their name in homage to the Crickets; Bob Dylan talks reverentially about the show he attended in which Holly made eye contact with him in the audience; Keith Richards saw an early concert and was captivated by “Not Fade Away,” which became one of the Rolling Stones’ early hits. The pride of Lubbock, Texas, Holly dropped the “e” in his last name due to an error on his first recording contract. Holly’s impressive string of classic songs included the glottal stop-filled “Peggy Sue” and the incomparable “That’ll Be the Day,” still sounding great on the hi-fi. Valens, an 18-year-old whose hits included “Donna” and “La Bamba” ” the first U.S. chart-topper sung entirely in Spanish ” virtually created Latino rock that paved the way for musicians like Selena, Los Lobos and Carlos Santana. Trivia question: Which future country music star, then a member of Holly’s band, the Crickets, gave up his seat on the Beechcraft Bonanza airplane to Richardson that fateful night? more than 8-1/2 minutes, is the lengthiest No. 1 single in history. recollections of music that has outlived the performers at summitup@summitdaily.com.